It's not entirely accurate to say that I stumbled across the work of David Alabo, but sort of. 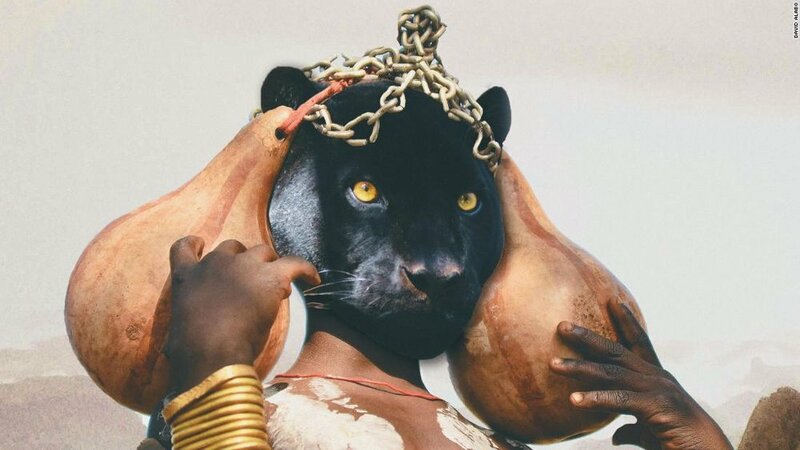 I was searching for art inspired by the Black Panther film and found myself immersed in some pretty amazing stuff. That ultimately led me to David's Instagram page, and once there I had a hard time leaving. I immediately reached out to the artist for an interview, which I'm happy to share here. Tell me about your medium and the images you use. I enjoy the medium of surrealism for its ability to transport an audience from reality into a universe involving elements you would never expect to work together. I have a strong connection to astronomy and deep space - the vast emptiness coupled with the brilliance of stars and planets. It’s beautiful to think that the absolute blackness of deep space allows stars and planets to shine bright. I love to highlight the dichotomy between the absence of light and its full manifestation in a spectrum of colors in my work. Also big cats, I just love big cats and everything they represent. The grace juxtaposed with their viciousness is a unique mixture that I find very appealing. Most of my work is digital. If my computer is too far away from me, I sketch down concepts on paper. I’d love to hear about your start in art, how it’s progressed for you so far. While studying in New York City, I was in a musical project with a couple of friends and we desperately needed cover art for our upcoming single. I felt very passionate about our vision as a band and decided to draft a few pieces to represent who we were. From there, I began to really build an interest in this form of creative expression and I never looked back since. Being recognized by CNN as a contemporary afrosurrealist (or afrofuturist) in the wake of the monumental Black Panther film release is both very humbling and motivating. I would love to attend art school in the near future and receive some form of formal education in the field. How would you explain your style of art? Heads, or the lack of them, are a recurring theme in a lot of my pieces. The subjects in my work often have spheres, planets, or big cats in place of their human heads. Most people are drawn to faces in an image so to remove that familiar focus point is to allow other elements in my work to take the foreground. Isolation is a theme that I’ve often explored in my works. There is a certain peaceful bliss that one can achieve in total solitude and in the desolate landscapes that surround my subjects. Afro-surrealism is the fusion of afro-centric elements with surrealism to create paradoxical fantastical worlds that highlight African culture in both a familiar and strange way. It’s a fine line creating art that resonates with my audience whilst taking them in a pensive journey through its abstract nature. Do you come up against any blocks keeping you from your art or has it always felt like an easy thing to keep in your life? Art has always been very therapeutic for me and it is something I hope to keep pursuing for the rest of my life. It is such a pleasure to have people recognize and love art that is first and foremost, a journey into creative introspection. Do you have any particular creative influences? The great surrealists before my time such as Pablo Picasso and Salvador Dali have always fascinated me with their vision and the playful attitude they took towards life and their works. Basquiat was my first introduction to the medium of abstract art. Through research, I discovered the works of contemporary artists like the Congolese painter Chéri Samba and Ghanaian artist El Anatsui. I’m always intrigued by the lives of these creatives and the struggles through which they were able to birth their works. My goal is to strive and create art every day. I plan on branching out into other forms such as painting and 3D design over the coming months. I am looking forward to having my first solo exhibition in Accra. That should be exciting.